Before Christmas we took advantage of the Premier Inn sale and booked a Friday night in Brighton for the end of January, so we had something to look forward to. 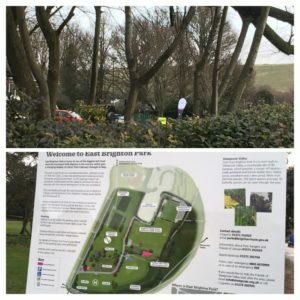 I knew I’d head to a parkrun on Saturday morning, and when I was down in the summer I heard people talking about a new one starting up near the marina/ Kemp Town (and I did hope for Kemp Town as I still need a K…). 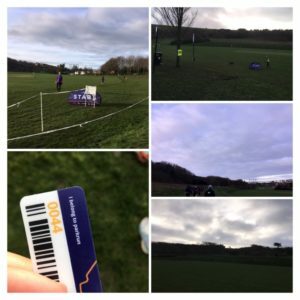 Anyway, East Brighton parkrun started in early December, so to complete all of the Brighton ones (depending on where you draw the line) I decided I’d head there. It was a 2 mile run in pretty much a straight line (parallel to the sea) through Kemp Town and to the park. Andy had mentioned that he thought the start was in the middle of the park, so I was quite relieved when I got there and could see the parkrun flag peeping over the bushes. I arrived at about 8.45 and ended up chatting to one of the runners who had been tail walker the week before. A couple of tourists came over and we all started chatting about where we had been and which courses we liked- they’d been to Ellenbrook fields which is always nice to hear, but I’d not been to any of their local ones (Guildford area). They’d completed their alphabet last year and were doing Wilson Index chasing and needed an event number 8- I just love that there are challenges like this to keep you going (although I didn’t need an E, or an East, or the number, I just wanted to tick off all the Brighton ones again). The guy doing the new runners briefing had a big map where he tried to explain the course- it looked totally confusing! But you know that with a parkrun you just follow the person in front and all will be fine. I also couldn’t believe that it would be 3.1 miles because you could see all of the park from where we were standing and it looked like the size of two football pitches, and it was only 3 laps. Then at the main briefing they warned us that if the air ambulance had to land on the football pitch then the parkrun would have to be stopped- a bit of added peril right there. I shall try to explain it as best I can. We started on the edge of the first park part (just a big grassy field) and ran along to where the park had large steps/ levels cut into the sides of the slope. On the first lap you took the top level, on the second lap the middle, and the final lap the lower one (you can see that on the bottom right of the map above). 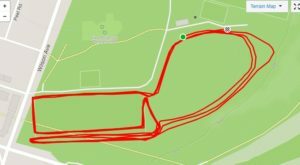 The rest of each lap ran along the top of the park (to the bottom left of the picture), before a u-turn, running on a slightly lower ledge, then you ran along the middle bit, another u-turn and then a lap of the football pitch, before running back to the start/finish area. It was grassy and muddy in places- we were pre-warned of some muddy slopes, and I wished I’d worn my trail shoes as they give better grip, so I took it fairly steadily. It was really fun though- wherever you were on the route you could see people running above you, below you, around the pitch and so on. The nature of the route meant that there weren’t a huge number of marshals but you passed each one many times- the lady by the slope (showing you were to go for lap 1, 2 and 3) had gold pom-poms and she did not stop cheering or shaking them the entire time- she probably used more energy than the runners! Some of the marshals you passed a couple of times on each lap and they were constantly calling out warning people of the slippery slopes and cheering. As I ran past the finish on my second lap, three people had finished but I only noticed one of them lapping me, and I think that was because of how the course was that people were just all over it at any one time. On my final lap there was a guy just ahead of me with a 50 t-shirt adapted to show 50 different parkrun venues, and he kept shouting at me “go tourist” and other friendly things and I would call back. As I came into the finish, he had finished and gave me another shout out. I got one of my highest finishing tokens for a while (44 out of 70 runners and first in my age category!). When I’d had my token scanned, I looked for the people I’d been chatting to at the start, and the tourist who was cheering me on, but I couldn’t see them, and as Andy was meeting me for breakfast I didn’t hang about. I would happily go back to this one- it is maybe a little further than Hove Prom (which is deceptively far from the town centre even though it’s perfectly run-able) but it was a really fun route. There’s a lovely run report here about how they are encouraging their community to use the park and join in. I met him at Cafe Coho where I enjoyed their delicious pancakes plus an Earl grey (of course), before a quick shower at the hotel. We then popped to Bird&Blend to get chai lattes before walking along the seafront to Hove. We timed it pretty perfectly as we got back to the town centre as it started to rain. I was feeling hungry again by that point so we sat in Pret and shared one of their delicious falafal and avocado wraps. We did a spot of shopping (I added to my tea collection and Andy treated me to some Montezuma’s chocolate)- we took the shopping back to the car and then went to a cafe for tea and a slice of lemon and blueberry cake. By then the rain had stopped so we had a bit more of a wander, although we tried to walk along the coast in the other direction but the wind had really picked up so we headed back to the lanes. We’d booked Bill’s for dinner (we had a voucher for 2-for-1) and then drove back home (in the pouring rain). 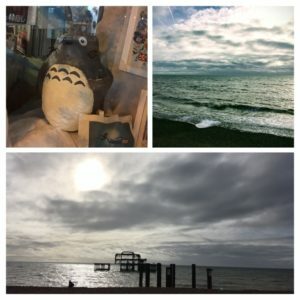 Such a nice 24 hours in Brighton. On Sunday I put my head out of the window and my it was freezing! All my long leggings were in the wash, so I put on leg warmers so keep my ankles warm. I was originally planning 12 miles, but after all the running and walking on Saturday I felt quite tired, and then when I first started running my knee was fine, but I stopped to get around someone walking their dog, and then it started feeling weird again. I walked for a bit and after half a mile or so I was fine to run, so I carried on. I hadn’t planned a route (sounds familiar) and when I got to the usual cut through to the lakes I saw a guy running up the hill towards Hatfield, a route I used to do a lot with the club, so though I’d head that way instead. The club run must have just finished as I was beeped and waved at by about 3 different cars (I recognised two of them!). The wind was so strong and I was so glad of my jacket- I’d worn it for the first few miles, thinking I’d take it off, but I kept it on the whole time. I managed 10.5 miles in the end and I’m happy with that. Brighton half marathon is still about a month away so I have time to add on the final few miles. I’d used the last of the panettone to make the baked French toast (this time with cherries and the Pip&Nut hazelnut chocolate butter which is pretty delicious) so while I had a shower that baked away. Like last week, Andy had been decorating the kitchen so he had elevenses (although it was more like twelveses) while it was my breakfast. Later we walked into town (I picked up my free Starbucks drink) and then after getting home I tried to do the big garden birdwatch- I think perhaps the wind was keeping the birds away because I saw hardly anything (although I did see two red kites). Where is your favourite place to head for a weekend away? 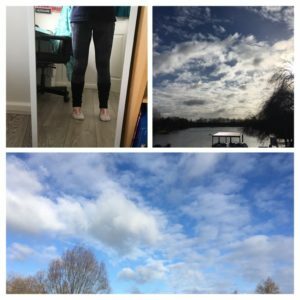 Author Maria RunsPosted on January 29, 2019 February 21, 2019 Categories General ramblings, Running, Stuff I love! Ahh I do love Brighton. Tho it is slightly tainted since I got my car clamped there (for my own stupid reasons). I know one of the Brighton event directors and he told me about the East Brighton one and I’d been tempted to do it when I was there last but it would have added complication to where I’d be parking my car. Plus in the end we had a lie-in so that sorted that debate out! The pancakes look delicious 🙂 I must try that tea shop you mention when I go back there. And Montezuma chocolates are so good! I had some of their white chocolate snowballs and they were DIVINE. Cafe Coho is so good- there is one right by the station or one by Fat Face- also a smaller one in the shopping centre but that’s a stand and doesn’t do all the lovely cooked things. Oh no about your car clamp 🙁 We’ve parked in the roads by Preston Park before- not too far to walk into the centre from there. 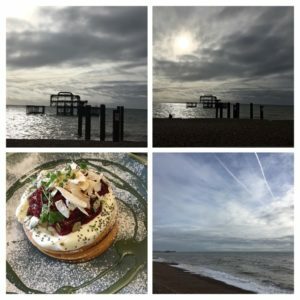 I love Brighton – Cafe Coho is always my first stop when getting the train there! Need to check out Bird&Blend when I’m next there! It is such a good cafe! And yes head to Bird&Blend as they do amazing tea lattes/ iced teas as well as selling the loose leaf and teabags etc too. Previous Previous post: Snow reason not to run!